ESSEX JR & SR. Public School is fundraising to help send intermediate students on a life changing Overnight Trip to Montreal. Support us by purchasing from Purdy’s Chocolatier, just in time for the holidays. After you’ve signed in you can buy Purdy’s delicious chocolates or invite others to join and support our Fundraising Campaign. All orders must be placed by November 28, 2018 in order to receive them before the Winter break. Purchases will be delivered to the school by December 16. 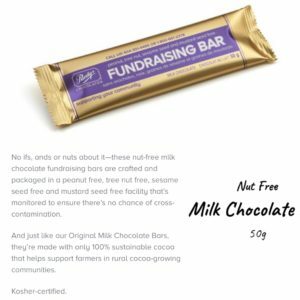 Purdy’s Peanut free, Tree Nut Free, Sesame Free Milk Chocolate Bars (50g) will be available to purchase onsite at the Winter Concerts for $3.00.